The primary designation of the Pozen Center as an educational facility is as the main studio/laboratory/training facility for the Studio for Interrelated Media Department. Due to its limited number of departmental classroom spaces, it is relied on heavily as a production studio and classroom for courses in SIM throughout the week each semester. It is also clearly understood that the Pozen Center is a valuable community resource and the SIM department strives to make it as available as possible to other members of the MassArt community. In the basement below the Pozen Center is the equipment sign-out room (“The Crypt”) and the office of the Studio Manager, Max Azanow. He has a reservation calendar there for booking use of the Pozen Center. An online version showing calendar dates when the space is already reserved is available online at: Pozen Schedule (Google Calendar). Anyone in the MassArt community can schedule and use the Pozen Center for MassArt events. As a technical production facility, its improper use can result in damage to the equipment and/or present a safety hazards to the users. The policy for access respects this fact. The first step in reserving the Pozen is to speak with the Studio Manager in the SIM equipment room and check the calendar for availability. Since the primary designation of the space is educational, as the main classroom for the SIM Department, you’ll find that it is heavily booked. All space inquiries are considered in the Departmental SIM meeting that is usually scheduled in Pozen every Thursdays at 1:30PM. (As with any event on campus you will also have to fill out an “Event Registration Form” and meet with the campus Event Resource Group (ERG). For further information regarding events coordination at Massart, you can contact Events Manager, Claudia LeClair (claudia.leclair@massart.edu) at 617-879-7861 or Guillermo Carreon (gcarreon@massart.edu.) at 617-879-7934). The Pozen Center is a relatively complex technical production facility. Productions in this space require the presence of a SIM tech person for the reasons given above. Coordinate with a Studio Manager to schedule an available SIM tech person (a SIM student or alum who has been trained in the proper use of the facility) to assist in any production in the space. As a member of the MassArt community, use of the Pozen space is free of charge, but the SIM tech person is not. If there is a qualified SIM tech person who has a special relationship with your event (for example, if the event is a collaboration with another department and SIM) then it is possible that the SIM tech will work on the event for free as well. In other cases they will need to be compensated at a rate negotiated with the SIM tech (currently the standard rate is $15/hour.) The SIM tech will be able to sign out keys, meet the organizers, coordinate the technical aspects of the production and lock up the space after it is over. Every year there is a student-run multimedia festival sponsored by SGA and the SIM Department called “Eventworks”. A necessary part of running the festival is to assemble a technical team that is competent for its technical production needs including use of the Pozen Center. The work of the Eventworks organizers is valuable vocational training for students interested in working professionally as producers and curators. Their job is to develop an artistic vision for the festival, not to be the in-house production team for other MassArt groups. 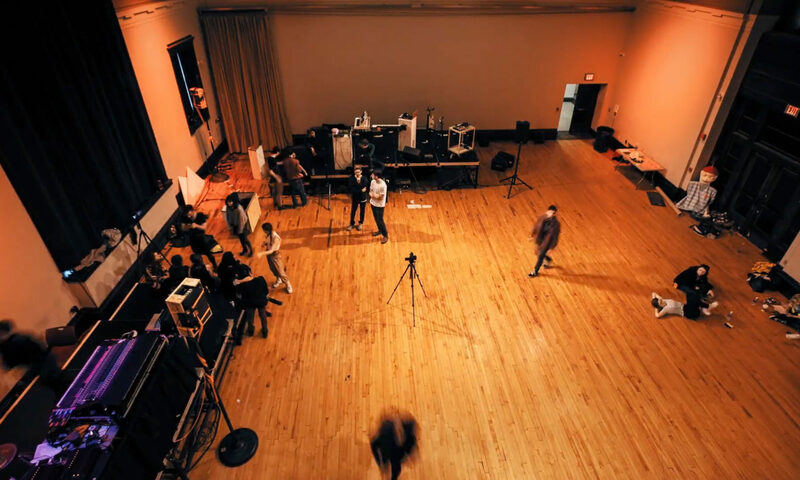 At their discretion, other MassArt organizations and events might be included among their festival events including all aspects of production in the Pozen Center. Any other usage of the Pozen Center not included in their plans for the Festival will need to arrange for a SIM tech through one of the Studio Managers in the usual way outlined above. To use the Pozen Space you will need to make a request at a Departmental meeting as outlined above, and check in with the Studio Manager, Max, so it is properly scheduled in the calendar. Note: There is almost no usage that truly has no technical needs. Even doing something as apparently simple as screening a video with sound coming out of the house system requires someone with proper training to set it up in the Pozen. Someone who doesn’t know what they are doing, experimentally patching and unpatching cables in the system can damage equipment and/or ruin scheduled classroom use by causing systems to go offline. For evening events, a SIM student liaison will need to be present to deal with key access and to make sure the space has been restored to its original state at the end of the event.